Food tastes better when you've cooked it yourself in the fresh air of a backcountry campsite. Our one person, stainless steel cook set includes everything you need to enjoy a great meal outside, including: a 1 liter pot, 6.25" frying pan, 6" plate, 8 oz plastic cup. 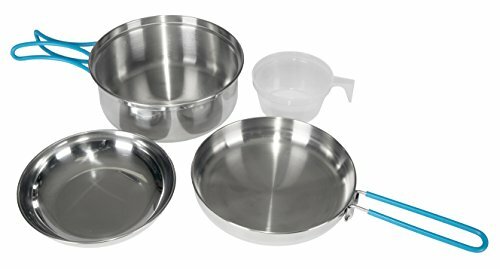 Constructed from durable, easy-to-clean stainless steel, the entire set nests together for easy packing and organization, and features foldaway handles that stay cool during cooking.